You don’t have to be a scientist to know that the computer of the future will talk, listen and understand. That computer of the future is the Apple Macintosh of today. Apple’s Speech Recognition and Speech Synthesis Technologies now give speech-savvy applications the power to carry out your voice commands and even speak back to you in plain English. 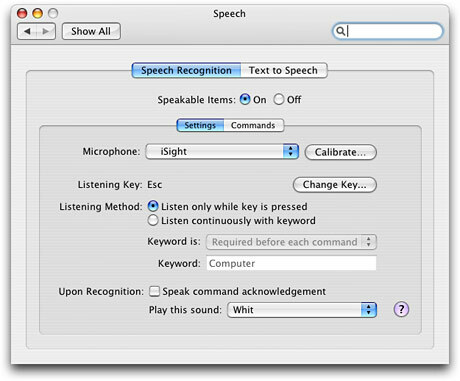 Apple Speech Recognition lets your Macintosh understand what you say, giving you a new dimension for interacting with and controlling your computer by voice. You don’t even have to train it to understand your voice, because it already understands you, from your very first word. You can speak naturally, without pausing or stopping. Apple’s leadership in speech recognition technology makes it possible by bringing a whole new dimension to the user interface: speech. Combined with VoiceOver, speech synthesis will help turn the graphical user interface into a vocal user interface. Provides products that help you control your Mac with your voice, speak anywhere you can normally type, and make you the envy of all those WinTel people. Also features quality headsets and other accessories to make your life even easier. Formed by experts who helped develop Apple's voice control technology, with Speakables you can tell your Mac or PC to do the things you've always wanted ----and you don't have to be sitting at your computer to do so!